Human Placental tissue presenting aspergillosis stained with Mouse anti Aspergillus antibody, clone WF-AF-1 (MCA2576). Mouse anti Aspergillus spp., clone WF-AF-1, is raised against the wall fraction (WF) of Aspergillus fumigatus. This antibody specifically recognizes members of the Aspergillus spp. including A. flavus and A. niger, reacting strongly with walls and septae, and to a lesser extent within the cytoplasm of hyphae. A. fumigatus, a thermophilic, opportunistic and angio-invasive filamentous fungus, is the main causative agent of systemic bovine aspergillosis, a worldwide and often fatal respiratory disease of cattle. 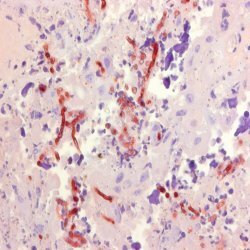 Clone WF-AF-1 has been successfully used in immunohistochemistry for the specific and consistent in situ diagnosis of bovine systemic aspergillosis, attributed to its binding to the major cell wall component, galactomannan. Clone WF-AF-1 has also been used for the identification of aspergillosis in human tissue sections. Mouse anti Aspergillus spp., clone WF-AF-1, does not bind to water-soluble somatic antigens (WSSA) of Aspergillus spp., but may react with galactomannans of members of the genus Penicillium. Spleen cells from immunised Balb/c ABom mice were fused with cells of the X63-Ag8.653 myeloma cell line. 1This product requires protein digestion pre-treatment of paraffin sections e.g. See Jensen et al. (2000) for details. Mouse anti Aspergillus spp. antibody, clone WF-AF-1 detects a band of approximately 106kDa of Aspergillus fumigatus wall fraction (WF). Jensen, H.E. et al. (1996) Development of murine monoclonal antibodies for the immunohistochemical diagnosis of systemic bovine aspergillosis. J Vet Diagn Invest. 8 (1): 68-75. Jensen, H.E. et al. (1996) Diagnosis of systemic mycoses by specific immunohistochemical tests. Jensen, H.E. et al. (1997) The use of immunohistochemistry to improve sensitivity and specificity in the diagnosis of systemic mycoses in patients with haematological malignancies. J Pathol. 181 (1): 100-5. Delaney, M.A. et al. (2013) Occlusive fungal tracheitis in 4 captive bottlenose dolphins (Tursiops truncatus). Vet Pathol. 50 (1): 172-6. Goodpaster, T. & Randolph-Habecker, J. (2014) A flexible mouse-on-mouse immunohistochemical staining technique adaptable to biotin-free reagents, immunofluorescence, and multiple antibody staining. J Histochem Cytochem. 62 (3): 197-204. Pesquisa Veterin&aacute;ria Brasileira. 34 (7): 637-642. Murase, H. et al. (2015) A clinical case of equine fungal placentitis with reference to hormone profiles and ultrasonography. J Equine Sci. 26 (4): 129-33. Dagleish, M.P. et al. (2010) Immunohistochemical diagnosis of infectious diseases of sheep. Small Ruminant Research. 92 (1-3): 19-35. Suzuta F et al. (2015) Variations in the morphology of Rhizomucor pusillus in granulomatous lesions of a Magellanic penguin (Spheniscus magellanicus). J Vet Med Sci. 77 (8): 1029-31. RSC Adv. 5 (20): 15728-15735. Ogasawara, F. et al. (2016) Concurrent Fowlpox and Candidiasis Diseases in Backyard Chickens with Unusual Pox Lesions in the Bursa of Fabricius. Avian Dis. 60 (3): 705-8.